Pamplona, Spain has Running of the Bulls, New Orlean has Mardi Gras, and Boston has it’s Marathon. 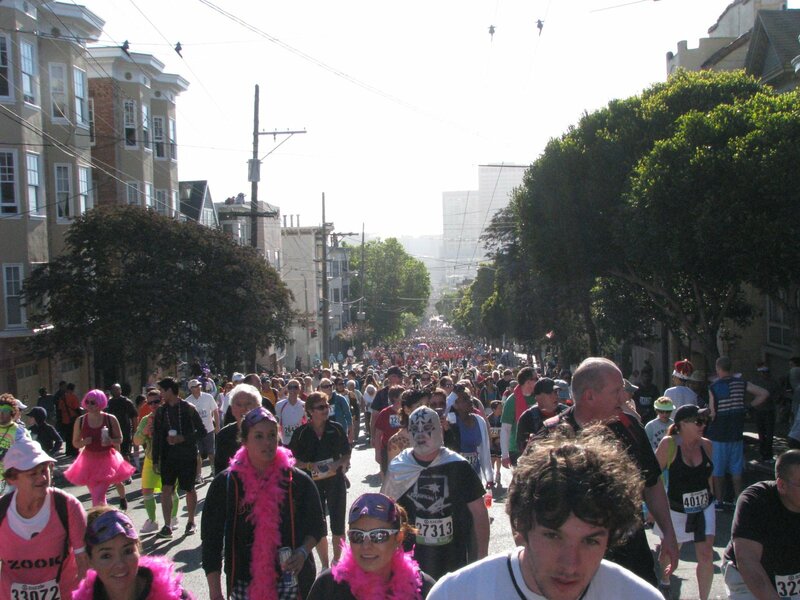 San Francisco has it’s historic 12k Bay to Breakers! This epic race features world-class athletes in addition to costumed runners and ‘fun loving’ folks out for a great day of running and walking through the beautiful streets of San Francisco. 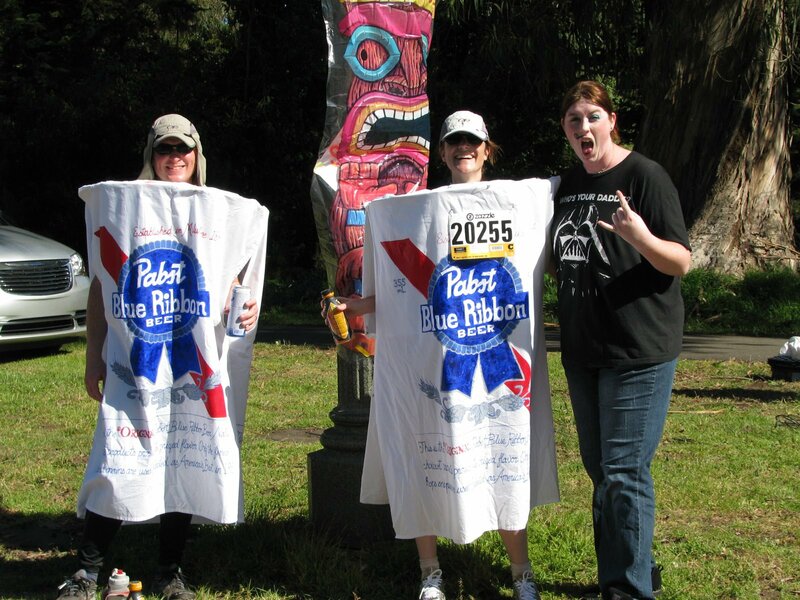 On May 20 2012, three of our staff members had the pleasure of participating in San Francisco’s 101-annual Bay to Breakers and had tons of fun! Thousands of Runners/Walkers marching up the steep but beautiful Hayes Hill. 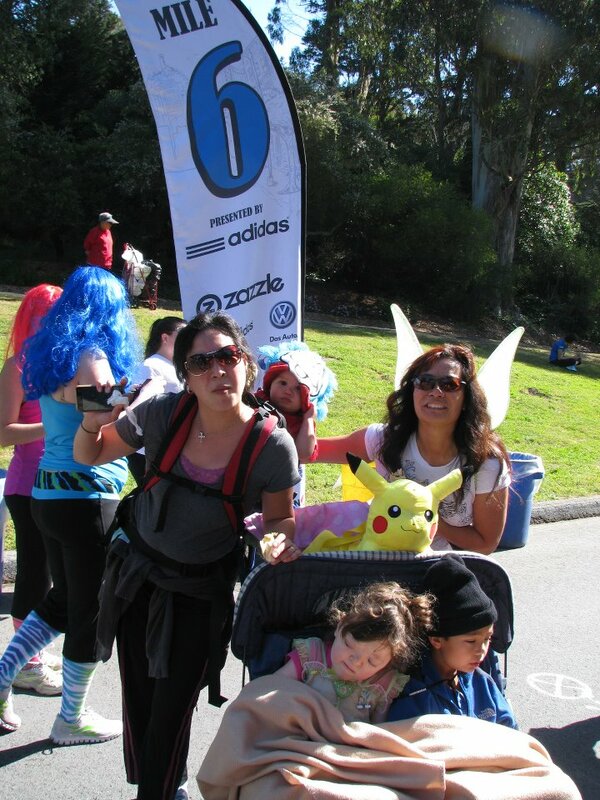 Physical Therapist Arleen with her sis Cheri and kids having blast at the 6 mile mark. Massage Therapist Sara rockin’ out with PBR runners. 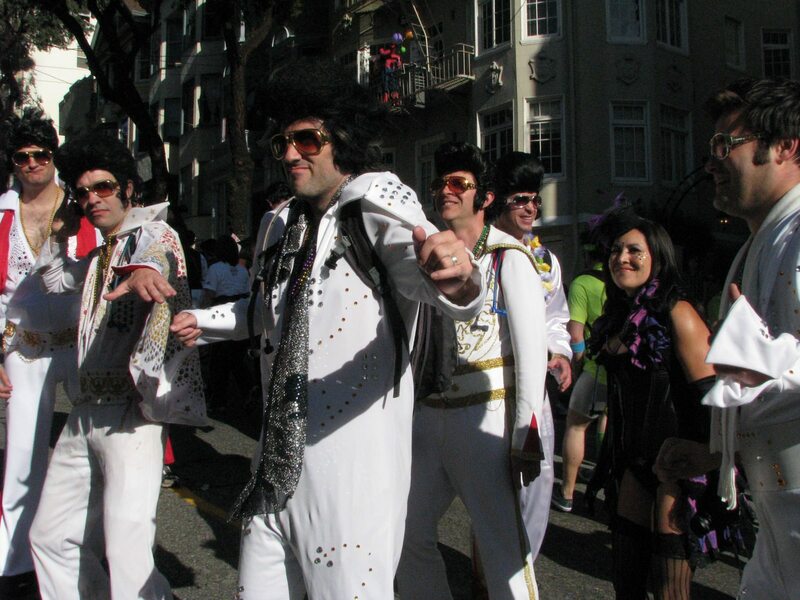 Elvis impersonators show some spirit along the race. 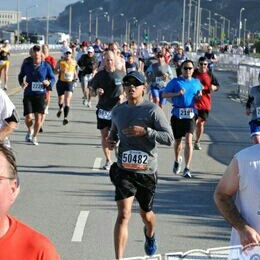 Kinesiologist Charles striking towards the finish line on Ocean Beach. 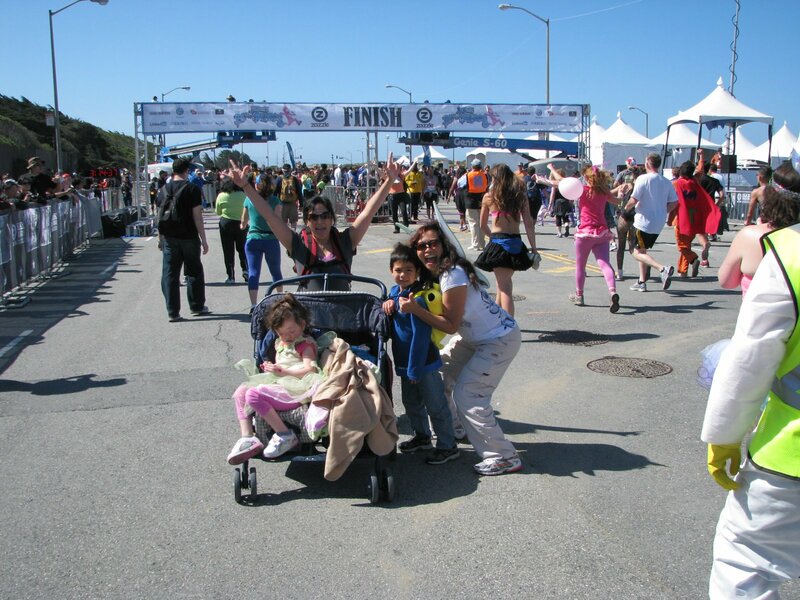 Arleen and family celebrating at the Ocean Beach finish line! Physical Therapist Arleen Thomas competed in the USA World Karate Nationals sponsored by USA National Karate Do Federation. In her 40’s, she locked horns with the 18 to 35 year old age group. The tournament took place at Cesar’s Palace in Las Vegas on Easter weekend. She lost gold in kumite due to penalty. Delivered too many head shots to opponent! Was angry because opponent delivered her an illegal knee kick that caused her to limp for 3 days. EMT checked on her opponent, who was thought to have a broken nose but ended up with shiner! 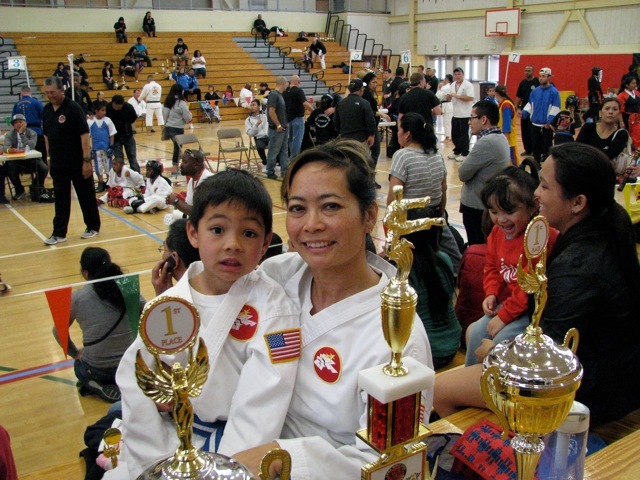 Above is a picture of Arleen and her son Kai with the silver medal she won! Footage of Arleen in ACTION! 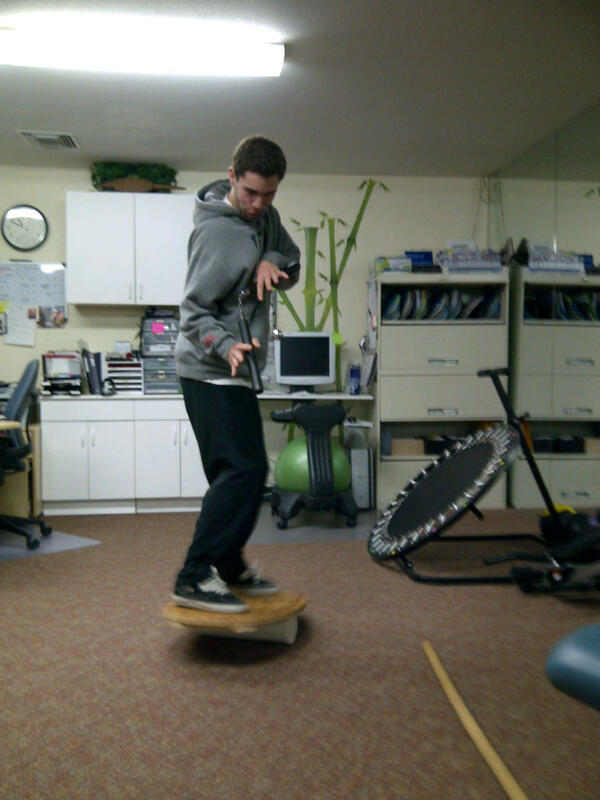 We work hard on creating exercises that acclimate to our patinets needs, making sure our patients have fun! 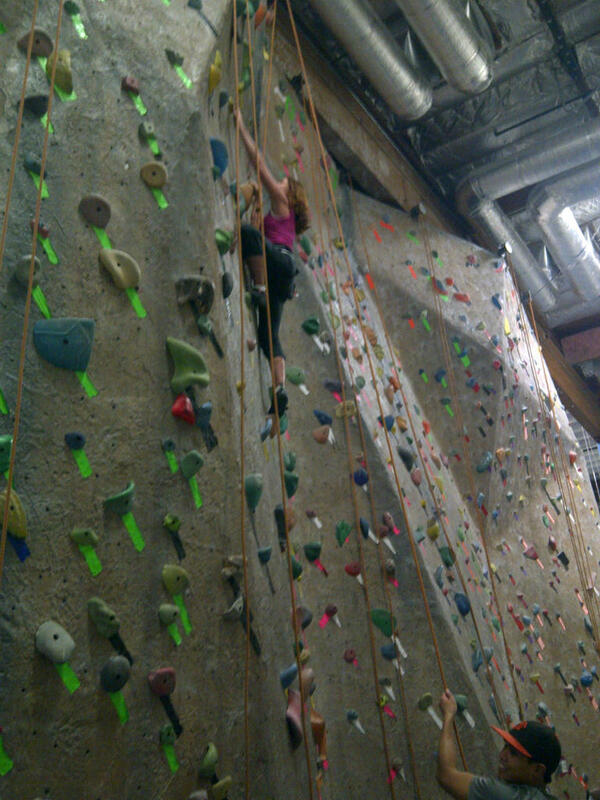 Patient Jill V. enjoying physical therapy while conquering the rock climbing wall! Talented Patient Gerald B. on the indo Board while using nunchuks. 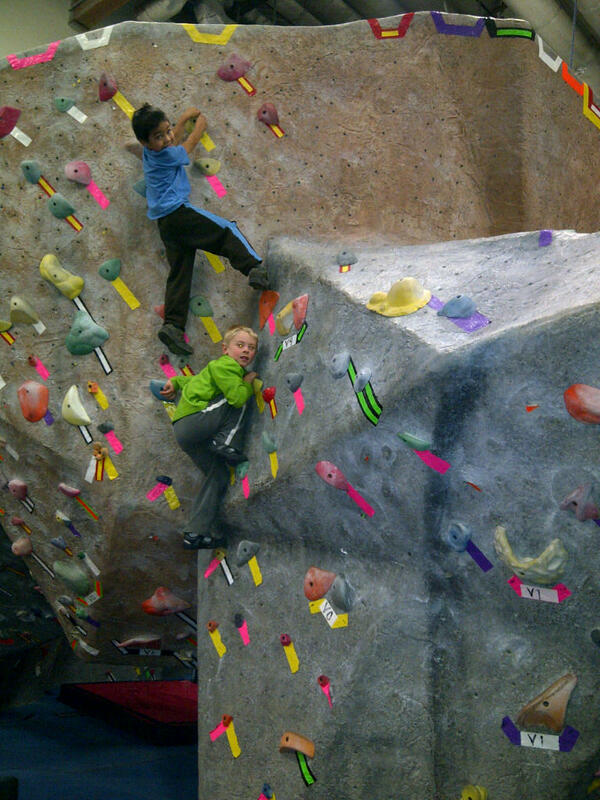 Physical Therapy with Ergosolutions will make you feel like a kid again! Posted in General News & Updates by adminuser. Comments Off on We work hard on creating exercises that acclimate to our patinets needs, making sure our patients have fun! Arleen’s Son Kai Competes In His First Tournament And Arleen Takes First Place! Kai did his blackbelt Kata, and Arleen took 1st place in weapons. In the grand finale, Arleen made 2nd place, missing it by a point! Not bad for someone who hasn’t competed since 1997! Arleen’s old instructor remembered her as did several other sensie’s there. Funny thing, they mentioned that her weapons kata was “old school” in other words very traditional and they wanted to know who her current sensei was. Even her current sensei didn’t know she would be competing-she decided to compete the day prior to the event and did a great job! She is one hardworking and deicated mother!! Posted in General News & Updates by adminuser. 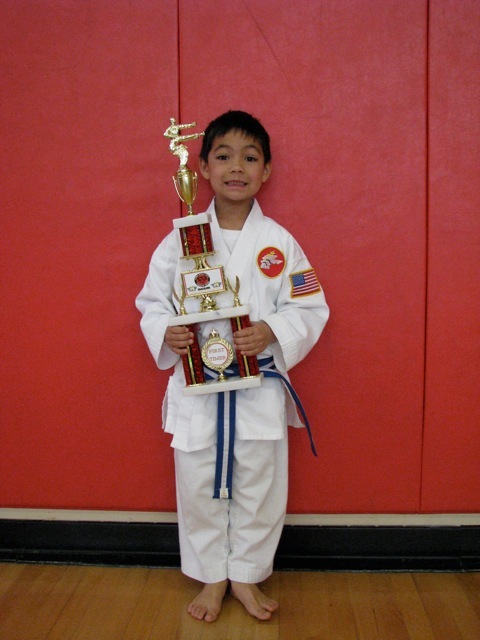 Comments Off on Arleen’s Son Kai Competes In His First Tournament And Arleen Takes First Place! The Las Vegas Strip is widely known for it’s modern hotels, dramatic architecture, vivid lights, casinos, restaurants, and nightlife. On December 4th 2011, Zappos.com hosted the Rock ‘n’ Roll Strip at Night 1/2 and full Marathon. The official charity of this race benefitted the Chrons’s & Colitis Foundation of America. With around 100,000 participants running in freezing cold whether, Kinesiologist/PT Aide Charles Soriano had the opportunity to be one of them running the 1/2 Marathon! The strip was closed for the race and was supplemented with bright lights guiding the pathway and numerous bands playing. The strip was swamped with passionate runners, having Charles penatrate his way to finish line. Below is Charles smiling after finishing the 1/2 Marathon in 2 hours. Instrucional Video on using the TENS unit with Physical Therapist Arleen! Instructional video on how to set your TENS unit mode 1 where you can wear it for hours at a time. TENS unit mode 2 is good for a 30 minute time period and beneficial if you are not responding to mode 1 set up. Posted in General News & Updates by adminuser. Comments Off on Instrucional Video on using the TENS unit with Physical Therapist Arleen! Happy 50th Birthday to Patient Bill! Happy 50th Birthday to our faithful patient Bill Cox, aka “Magneto.” He loves Physical Therapy so much that he came in on his Birthday. Posted in General News & Updates by adminuser. 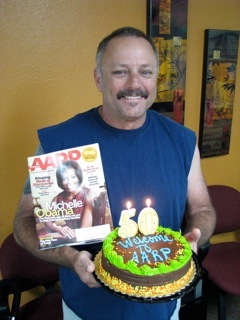 Comments Off on Happy 50th Birthday to Patient Bill! Congrats to Allejandra and new baby Gisselle! 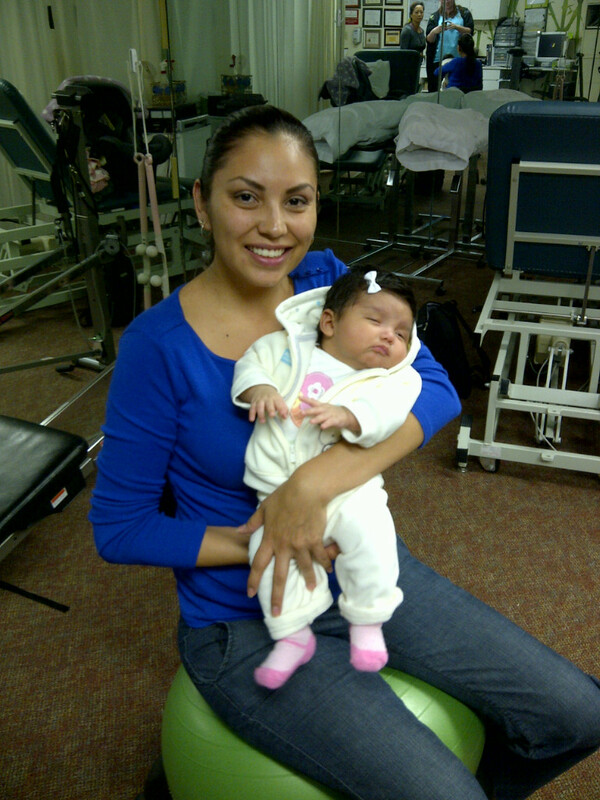 Patient Allejandra and new baby Gisselle, born on September 10, 2011. Weighing in at 6lbs and 15 oz. 19 1/2 inches. She reminds the staff of “Boo” from Monsters Inc.
Posted in General News & Updates by adminuser. Comments Off on Congrats to Allejandra and new baby Gisselle! Over the years, we helped many many people regain their health and improve their lives. On this site, you’ll find tips on how to recover from injuries quicker, train your body function, and find the key to a balanced lifestyle. We look forward to getting to know you, and helping you with your goals. Please feel free to browse the site, and sign up for our free newsletter. This could be the first day of a new you! Posted in General News & Updates by adminuser. Comments Off on Welcome to our blog! Congrats to Talley for his hard work and dedication! !